There are no events planned for the weekend that we are aware of. January 1 1940 - Identification Friend or Foe (IFF) coding is introduced to identify Bomber, Coastal and Fighter Command aircraft for the air defence system. VHF Radio Telephone installations are also completed eight selected sectors. January 2 2004 - USA Spacecraft Stardust successfully flies past Comet Wild 2, collecting samples that are returned to Earth. January 2 1967 - The National Supersonic Transport program, formed by President John F. Kennedy for the purpose of subsidizing the design of a Concorde-fighting supersonic airliner, awards a contract to Boeing for its 2707 SST design. Despite 115 orders from 25 different airlines, the program would lose its funding in 1971, forcing Boeing to lay off 60,000 workers. January 2 1959 - Launch of Luna 1 (E-1 series), first known as First Cosmic Ship, then known as Mechta, first spacecraft to reach the vicinity of the Moon. First of the Luna program of Soviet automatic interplanetary stations. January 2 1954 - A new coast to coast record in the US is set by Colonel Willard W. Milliken of the Air National Guard, flying a North American F86 Sabre jet and covering 2,530 miles (4,070 km) from Los Angeles to New York in 4 hours 8 min. (time includes stop for fuel at Offutt AFB). January 2 1943 - McDonnell gets a contract to build the Navy's first jet fighter. January 3 1999 - Launch of Mars Polar Lander, also referred to as the Mars Surveyor '98 Lander, NASA 290-kilogram robotic spacecraft lander, to study the soil and climate of Planum Australe, a region near the south pole on Mars. January 3 1964 - A United States Air Force B-52D Stratofortress carrying two Mark 53 nuclear bombs loses its vertical stabilizer in turbulence during a winter storm and crashes on Savage Mountain near Barton, Maryland -- this is known as the 1964 Savage Mountain B-52 crash. Only two of the five crewmen survive. The bombs are recovered two days later. January 3 1944 - Japan launches first Fu-Go bombs, aka fire balloons or balloon bombs. Released from Japan, the balloons were meant to be pushed across the Pacific by the jetstream and then crash into the U. S. mainland and explode. A fascinating idea, but not a very effective weapon: Of the 9,000 balloons launched, only six Americans were killed. 300 of the balloons were ever found in North America, and it is estimated around 600 others likely landed in uninhabited deserts, forests and mountains. January 3 1496 - Leonardo da Vinci unsuccessfully tests a flying machine. January 4 1998 - A passenger dies after suffering a reaction to secondhand smoke on board Olympic Airways Flight 417, a Boeing 747, leading to regulations on smoking on aircraft. January 4 1989 - Two United States Navy F-14 Tomcats of Fighter Squadron 32 (VF-32) aboard the aircraft carrier USS John F. Kennedy (CV-67) shoot down two Libyan Air Force Mikoyan-Gurevich MiG-23s (NATO reporting name "Flogger") off the coast of Libya using AIM-7 Sparrow and AIM-9 Sidewinder air-to-air missiles. They are the third and fourth of five kills scored by F-14s during the Tomcat? '?s career in U.S. Navy service. January 4 1958 - Sputnik 1, the first artificial satellite to orbit the Earth, fall out of orbit and back to terra firma. January 4 1945 - The Japanese make their last kamikaze attack on the U. S. invasion force off Mindoro, causing a cargo ship carrying ammunition to explode, killing all 71 merchant mariners on board. January 4 1944 - North American P-51 Mustangs score 18 victories. 1944 there were 17 P-51 fighter groups in England. Of these, the 357th Fighter Group had 609 aerial victories. January 4 1895 - Birth of Leroy Randle "Roy" Grumman, American aeronautical engineer, test pilot, and industrialist. Co-founder of Grumman Aeronautical Engineering Co. later to become Grumman Aerospace Corporation, now part of Northrop Grumman. January 5 1949 - Charles "Chuck" Yeager using a Bell X-1 carried out the only conventional (runway) take off performed during the X-1 program, reaching 23,000 ft (7,000 m) in 90 seconds. January 5 1939 - Amelia Mary Earhart, noted American aviation pioneer and author, is declared legally dead after disappearance in 1937. January 5 1916 - First flight of the Nieuport 11 (B�b� Nieuport), a famous French WWI single seat biplane fighter. January 6 1968 - NASA'S Surveyor 7 lands on the moon, and is the last in its series. January 6 1942 - Pan American Airlines becomes the first commercial airline to schedule a flight around the world. AVIATION safety chiefs are set to exempt toy drones from strict rules that could land parents with a hefty fine this Christmas. Remote-controlled quadcopters - commonly referred to as drones - are one of the hit toys this Christmas with thousands of the machines set to be unwrapped on December 25. But even tiny toy drones made of foam and costing as little as �30 are subject to Civil Aviation Authority (CAA) rules which mean they cannot be flown within 50 metres of a building. All drones, including small "toy" models, are banned from flying within 50m of buildings. Breaking the rule could land the offender with a �5,000 fine. A CAA spokesman yesterday confirmed they were considering a rule change, although it is unlikely to happen before Christmas. He said: "With devices weighing less than a kilogramme there are much smaller safety risks and the CAA is considering introducing an exemption for these very small devices in the near future. "These are typically hand held devices and the toy end of the market." He added: "I don't think we will do it before Christmas." Riccardo De Felice, owner of Marionville Models in Edinburgh,said there has been a "boom" in the drone business. "On Christmas day the skies will be black," he said. "The thing with drones is you can buy one from �20 to �1,000. The size of the market is huge." He said the CAA is facing an increasingly difficult task keeping up with developments. "The drone market didn't exist 20 years ago," he said. "Some are so small and light if you get hit by one it isn't going to injure you. It isn't going to be pleasant but it's not a big deal." He said an exception for devices under 1kg would be a "clever move" as the law as it stands would be unenforceable. "There will be no arrests of little Johnny on Christmas day," he said, although technically many children will be on the wrong side of the law. He continued: "Even a multirotor made from foam flying in a congested area is technically breaking the law. "I'm sure the CAA will do the right thing in the end. This would definitely be a step in the right direction." Japanese transport authorities on Friday ordered a budget airline to boost safety standards after it promoted a trainee to a full-blown pilot despite worries over ability. Air Do, which links Tokyo to cities in Japan's northernmost prefecture of Hokkaido in a tie-up with major carrier All Nippon Airways, was also found lax on aircraft maintenance check-ups. The government said a co-pilot on training at Air Do bungled a landing at Chitose airport in Hokkaido on Sept. 11 by coming in too quickly. The instructor gave a good mark, paving the way for promotion, but when the company examined flight data, the error became apparent. They nevertheless let the trainee's promotion stand. "The company's training systems for flight crews is not functioning properly," the transport ministry said in its order to Air Do. The ministry also noted Air Do was found to have put off necessary regular check-ups on aircraft. The company was ordered to submit measures for improvement by Jan. 30. No immediate comment or details were available from Air Do. The incident came to light as Japan grapples with a growing shortage of qualified pilots. Other Japanese budget airlines canceled flights earlier this year because they did not have enough people to fly their planes. The U.N.'s aviation agency warned two years ago that demand for pilots is expected to double by 2030, with the shortage of crew particularly acute in Asia, Africa and Latin America, where markets are expanding rapidly. Eastern Airlines planes can again be spotted at Miami International Airport. A start-up outfit that hopes to reboot the Eastern Airlines brand took delivery of its first aircraft Friday in Miami. The jet received a water-cannon salute upon arrival to the airport. The aircraft shown Friday is a Boeing 737-800 that previously flew for Kenya Airways, according to Airways News. 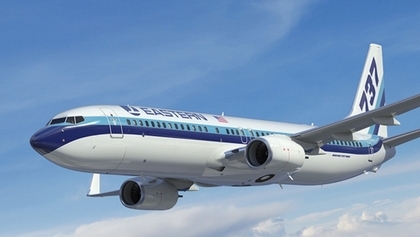 Beyond that first aircraft, Eastern has placed orders with Boeing for 10 new 737-800s. The carrier also has options for 10 newer-version models of the jet. The Sun Sentinel of South Florida writes "the effort to relaunch the U.S. passenger airline is spearheaded by Miami-based Eastern Air Lines Group Inc., which bought the intellectual properties of the former iconic airline brand in 2011." The company intends to start with charter flights before expanding into regularly scheduled passenger airline service. Eastern said in January 2014 that it had hoped to begin flying this month, but now has projected March 2015 for its debut, according to CNN. It was unclear what the initial destinations might be for the Miami-based airline, though Airways pointed to Cancun and the Bahamas as possibilities for the company's early charter routes. The original Eastern began flying in 1927 and went on to become one of the USA's biggest and most-identifiable airline brands before falling into hard times and abruptly shutting down in 1991. The "new" Eastern's attempt to resume flying from South Florida appears to have struck a sentimental chord in Miami, where the original Eastern was based and was one of the region's biggest employers. "I never thought it would be back, and we are pleased," Miami-Dade County Mayor Carlos Gimenez is quoted as saying by Airways at Eastern's event to show off its new plane on Friday. "Eastern's headquarters has returned to Miami after 23 years." Embraer's Legacy 500 executive jet today was granted certification by the European Aviation Safety Agency (EASA) during a ceremony at its headquarters, in Cologne, Germany. This approval enables entry into service of the aircraft in the Member States of the European Union as well as in EASA associated countries. "EASA's certification is a very important achievement for the Legacy 500, which is introducing advanced technologies and superior comfort in the midsize class," said Marco T�lio Pellegrini, President and CEO of Embraer Executive Jets. "The approval of this revolutionary aircraft is a testament to our commitment to deliver true innovation to the market." "This certificate demonstrates the excellent safety performance of Embraer aircraft and the outstanding cooperation spirit which is in place between EASA, the Brazilian Airworthiness Authority ANAC and Embraer, making excellent use of the EU/Brazil Bilateral Aviation Safety Agreement," said Norbert Lohl, EASA Certification Director. "It was Embraer that received the first EASA Transport Airplane Type Certificate in 2004 and are receiving now, 10 years later, another important one for the Legacy 500." The Legacy 500 has met or exceeded all performance expectations, having also received certification from Brazil's ANAC (Ag�ncia Nacional de Avia��o Civil) in August and from the FAA (Federal Aviation Administration) in October. The Legacy 500 is now able to begin operations in Europe, Brazil, United States and in countries that require EASA or FAA certification. The first Legacy 500 was delivered to a Brazilian customer, on October 10. Some Christmas fliers got their wings clipped ? literally. 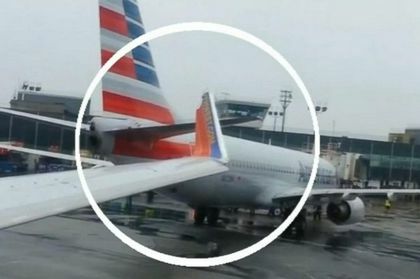 Two jets at New York's LaGuardia Airport got a little too close for comfort Tuesday morning, with one ripping the wingtip off the other. No passengers on either plane were injured. American Airlines Flight 1104 from Dallas was taxiing to its gate just before 11 a.m. as Southwest Airlines Flight 449 to Denver was departing. The left winglet ? a vertical fin at the tip of a wing designed to improve airflow and fuel efficiency ? was ripped off the Southwest plane after it made contact with the American jet's left horizontal stabilizer, part of the tail. Both planes were Boeing 737s. American spokesman Joshua Freed said in an email that the airline's plane "was taxiing with the help of ground personnel walking near each wingtip." Southwest refused to say if the airline also had workers on the tarmac assisting its pilots, or if that was required by company policy. Its flight left the gate 23 minutes late and there was a light rain at the time of the accident. The 143 Southwest passengers and five crew members exited the jet via stairs and were then taken by bus off the tarmac. The aircraft was taken out of service for inspection and repairs. Southwest is finding alternative ways to get the passengers to their destination, according to spokesman Brad Hawkins. The American plane, with 143 passengers and six crew members, made it to gate D7 and passengers left the aircraft via the jet bridge. The plane will be kept in New York overnight for inspection. A replacement jet was used to make the trip back to Dallas, a flight that was delayed about three hours. The Southwest jet moved out of the taxiway on its own power, according to Ron Marsico, a spokesman for the Port Authority of New York and New Jersey, which runs the airport. Marsico said there are no other delays because of this accident and that the Federal Aviation Administration is investigating. Is it a bird? Is it a plane? Well, it was both on the eight occasions in 2013 that birds hit flights at airports in Greater Manchester. According to data released by the Civil Aviation Authority, birds disrupted flights on five occasions at Manchester International and on three occasions at City Airport (Manchester Barton) last year. These instances include one on July 27 when the cabin crew of a Boeing aircraft on the approach to Manchester International noticed a strong burning smell coming from the plane. A bird in question had been sucked into one of the main engines causing this smell. The plane landed safely. On March 24, an Airbus plane had to abort its take-off from Manchester International after a medium-sized bird flew very close to the right side of the plane. 24 March 2013 Manchester Intl Airbus Rejected take-off due to birdstrike. No damage reported. 19 May 2013 Manchester Barton Eurocopter Birdstrike to lower windscreen. No damage found. 8 June 2013 Manchester Barton Evektor Aerotec Birdstrike on take-off. No damage reported. 6 July 2013 Manchester Barton Cyclone Airsport Aircraft returned following birdstrike. 24 July 2013 Manchester Intl De Havilland Birdstrike shortly after take-off. Damage to wing leading edge inboard of LH nacelle. 27 July 2013 Manchester Intl Boeing Birdstrike during final approach. The bird had been ingested into nr1 engine. 13 August 2013 Manchester Intl Airbus Rejected take-off due to birdstrike. Nr2 engine fan blade severely dented. 10 October 2013 Manchester Intl Embraer Birdstrike with damage. The Civil Aviation Authority recorded 208 instances of birdstrikes in 2013, affecting UK flights and occurring at airports of various different sizes. Some incidents caused a lot of obvious damage to aircraft including one instance at Newcastle Airport where a passenger reported seeing smoke and a possible fire from the left hand engine of the plane. A small flock of birds had taken off as the plane set off and one of them were thought to have been sucked into the engine. The plane issued a MAYDAY call and returned to land back at Newcastle. However, there are some examples of birdstrikes where the collision goes unnoticed by crew or passengers and is only discovered upon post-flight inspection. Birds of all shapes and sizes were involved in the incidents including buzzards, wood pigeons, gulls and swallows. Some collisions occurred mid-flight at heights of thousands of feet in the air while others occurred on the ground and prevented the aircraft from taking off. On one occasion at Kirkwall airfield on the Orkney Isles a single gull held up the take-off of a plane when it stood in the runway and refused to move despite the plane speeding towards it at around 100 miles per hour. In this particular game of chicken the gull won and the plane had to brake and taxi back to the airport before taking off again. July was the most common time of year for a birdstrike with 33 of the 208 collisions occurring during that month. May was the second most common with 27 while August came third with 25. February was the least likely month for a birdstrike to occur with only five instances recorded in that month. Heathrow had more bird collisions than any other airport with 18 while the most common type of plane to be involved in a birdstrike was an Airbus with 74 in 2013.